CHICAGO (WLS) -- Feeling distracted by the possibility that the Cubs could win their first World Series since 1908? Don't worry, the Cubs have your back. 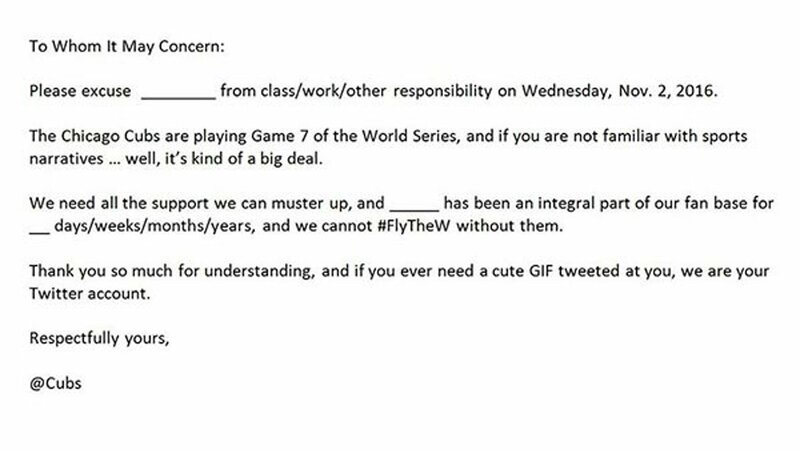 On Wednesday morning, the team shared a light-hearted "official excuse note" that fans can send to their bosses to relieve them from their usual work or school responsibilities so that they can cheer the Cubs on to victory. The excuse note reads, in part: "The Chicago Cubs are playing Game 7 of the World Series, and if you are not familiar with sports narratives... well, it's kind of a big deal. We need all the support we can muster up, and ___________ has been an integral part of our fan base for ____ days/weeks/months/years, and we cannot #Flythe W without them." Taking it a step further, the Cubs even wrote a specific note to one fan's boss. Diehard Cubs fan Adam Jacobi tweeted: "I need to wear a Cubs hat at my desk tomorrow or they might have to forfeit. Please tell my boss this." So, the Cubs tweeted back with a note for Adam to give to his boss. The note reads, in part: "You may have noticed that Adam Jacobi is wearing his Cubs cap at his desk today... What you didn't know is that if he is forced to take it off... We will have to forfeit World Series Game 7. Strange, but true. You don't want that on your conscience... Do you?" Apparently, it worked. Jacobi tweeted out a photo of himself sitting at his desk with the caption "mission accomplished." Many in the Chicago area are getting creative with their work schedules around the World Series. IF CUBS WIN, DOES PRODUCTIVITY LOSE? Many in the Chicago area are getting creative with their work schedules around the World Series. The mayor of Elgin even scheduled Wednesday evening's meetings earlier so that everyone could watch Game 7. At the Arrowstream office in Chicago, Jason Wowk said he's motivated to get logistics all set. "It's been 24 hours of pure anxiety," said Jason Wowk. "Today I've been just trying to bury in and just get everything done as fast as possible with the hope of possibly leaving early." In accounts payable, Rita Wettstein is trying to get all those accounts paid. "Oh my god it's crazy. When you're a Cub fan your whole life, you dream of this," Wettstein said. With memories of watching the games after school as a girl with her dad, the workday leading up to Game 7 Wettstein is having a tough time. "I can't concentrate. My boss knows," Wettstein said. Fortunately, their boss understands. While Frank Morgiewicz grew up a Yankees fan, he sees the ability to celebrate with coworkers as a long-term win. "This is a very collegial atmosphere, people work together and work across departments so it's been really beneficial," said Morgiewicz. Outplacement specialist Challenger said taking the long view can be good for productivity, but there could be an excused slow down. "There probably is a hit on productivity the day after a game. If the Cubs win the World Series today, there's a lot of people not coming in to work tomorrow. Certainly in the morning, there's a lot of people bleary-eyed and not doing much work," said John Challenger, of Challenger, Gray and Christmas.